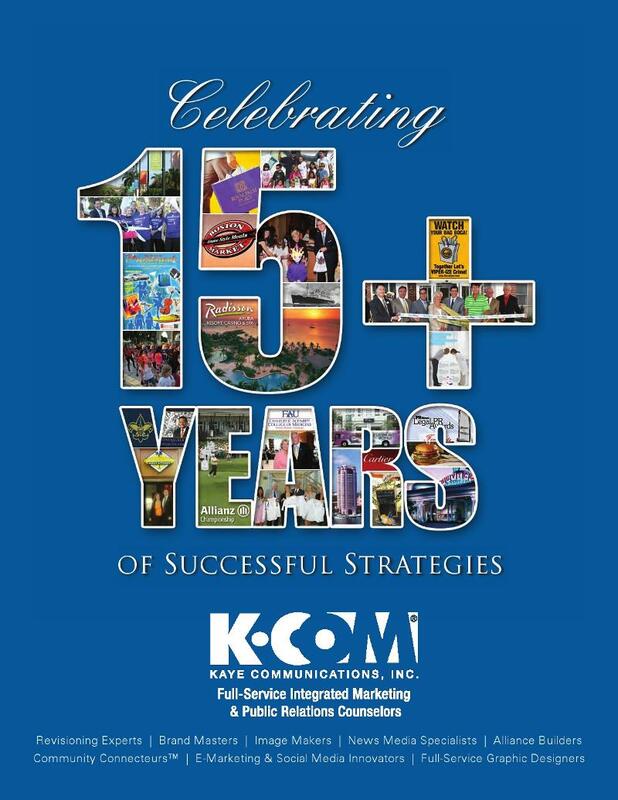 Boca Raton, FL (March 30, 2012) – Kaye Communications, a South Florida-based full-service marketing and public relations firm serving regional and national clients, announced today that it has launched a SERIOUSLY STRATEGIC! (SM) expanded services platform and unveiled a new division, KCOM-WRITES. The expansion makes the firm’s signature market-relevant communications strategies, community engagement initiatives and ‘original’ content development accessible to companies and organizations of all sizes in a variety of industries and budgets. According to Kaye Communications President and Chief Strategist Bonnie S. Kaye, KCOM-WRITES – staffed by a team of professional writers, award-winning journalists, columnists and editors – will focus on developing strategic results-generating content and brand messaging to establish and/or strengthen client brand positioning and influence, awareness and reputation in today’s ever-evolving 24/7 competitive communications age. Long-operating as a hybrid in the marketing and public relations industry with its integrated inclusion of other business disciplines (i.e. leadership and sales training), Kaye Communications’ practice areas include: KCOM-Strategic, KCOM-Think Tank, KCOM-BrandMaster, KCOM-Media Relations (print, broadcast, and digital), KCOM-Online & Social (including search engine optimization and blog series planning), KCOM-Connect (Community Engagement), KCOM-Crisis Solutions, KCOM-Public, KCOM-GREEN (Sustainability Initiatives), KCOM-Events, KCOM-Writes (“Original” Content Development), KCOM-Creative (Graphic & Web Design) and KCOM-Outsource (Executive-On-Loan). With more than 65 years of combined principal experience to draw upon, the firm’s strategic client concentrations focus on clients in healthcare, hospitality, lifestyle (residential development, spas, etc. ), professional services, legal, ACE (arts, culture and entertainment), campaigns and conferences, public entities (government agencies, community redevelopment agencies, business improvement districts), sports and GREEN/sustainability fields. According to Kaye, the expanded platform and KCOM-WRITES will deliver the level of services the firm principals have successfully developed and implemented on behalf of national and regional brands, including Boston Market; Boca Raton Resort & Club; Promise Healthcare; Radisson Aruba Resort, Casino & Spa; Boca Raton Community Redevelopment Agency (CRA) for the Downtown Boca destination; Downtown Boca’s inaugural Meet Me On The Promenade Streetside Fest; Allianz Championship, a PGA Champions Tour event; Muvico Theaters; California Pizza Kitchen; Law Offices of Lesser, Lesser, Landy & Smith, PLLC; the Charles E. Schmidt College of Medicine at Florida Atlantic University and Home Box Office (HBO). Kaye Communications, Inc. is headquartered at South City Plaza, 1515 South Federal Highway, Suite 103, Boca Raton, Florida 33432. For more information on the firm’s practice areas and overview of client services visit www.kcompr.com, call 561-392-5166 or email SmartStrategiesBegin@kcompr.com.